The 69th annual Randall County Junior Livestock show is now taking place at the Happy State Bank's, Randall County Event Center. There are 190 children exhibiting their livestock for judging throughout the weekend. "This is the biggest event of the year for Randall County, particularly with our young 4-H kids and Future Farmers of America," said AgriLife Randall County Extension Agent, Dr. J.D. Ragland. "This is an opportunity for them to showcase all their hard work and effort that they have been putting into their livestock." This event is continuing to grow. In 2014, there were about 368 animals to be judged which has almost doubled for 2017. It took more than three days to prepare and lay out the pens and the showing corral. "This year is the largest number of entries for the Randall County Livestock Show, we have a total of 507 entries, with our swine show bring the largest with a total of 308 head," Ragland said. Children from all ages can enter as many as three animals from each of the seven animal categories. Along with the 308 swine this year, there is also 75 rabbits, seven poultry, 53 sheep, 34 goats, 14 heifers and 16 steers. The goal with this livestock show is to teach children how to take care of a show animal for months or a year or more. 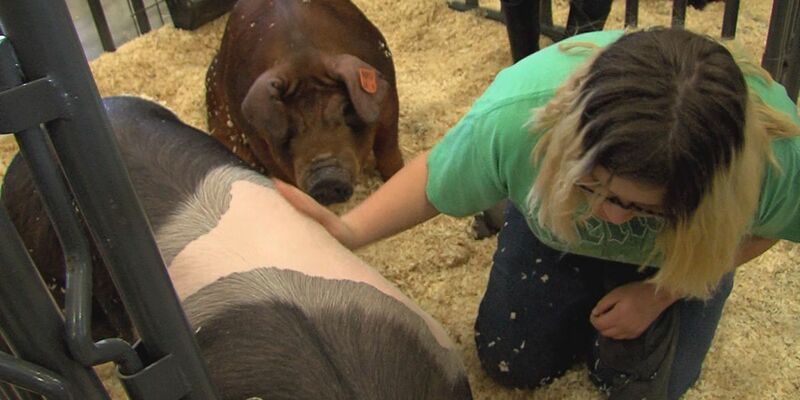 For one student, this is her first year entering with her black cross swine "Dustin." "I'm going to make the most out of my first year," Junior Exhibitor Brooke Carrithers said. "I just need to pay attention to Dustin, the judge and show my best. Before today, I had to train him to keep his head up, teach him to go left or right and just keep him walking." Amarillo - The 2017 Randall County Junior Livestock Show will be Thursday, Jan. 19 to Saturday, Jan. 21. and is free to the public. Jan. 23 at WT Legacy Hall (in the Jack B. Kelley Center, "JBK") there will be an appreciation dinner beginning at 6 p.m. awards and auctions will follow. For more information, can call the Randall County extension office at (806) 468-5543.